I remember very little of Mortality's early days, save for seeing their name on the odd gig flyer here and there. From what I understand from the Australian Metal Guide they were formed in the early nineties and were originally a Pantera styled thrash band. It wasn't until somewhere around 1996 that I had much interest in the band. This interest was sparked by some casual interaction that a mate and I had with Craig Figl who at the time was working at Venue Music in Parramatta and had also recently replaced Darren Jenkins as guitarist for Mortality. When this album was released, Warhead Records were a force to be reckoned with in the Australian music scene and had been responsible for releasing a large portion of the premier Australian metal albums of the mid nineties. As such this album received a large amount of promotion and plugging (mainly through the staff of the Hammerhouse which was the shop run by the owners of Warhead Records; Brad Sims and his partner Julie). 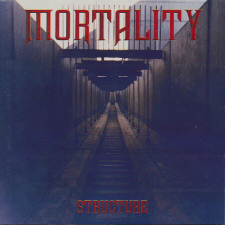 Structure borrows much of its sound from two distinct bands who had both put out two groundbreaking albums the previous year; Fear Factory with Demanufacture and Meshuggah with Destroy Erase Improve, although the most direct influence is the former. The album had a major impact on me because it didn't resort to cloning its influences, but rather integrated those sounds with the band's own thrash style which made it familiar but somewhat unique. If Structure were to be released into today's market, I'm not sure how it would be received by the average metal fan. I still enjoy this album immensely, though it occurs to me that some of this may be a result of nostalgia. Regardless of any pre-existing sentiment I feel towards this album, there can be no denying that there are some top notch songs which showcase a band with huge amounts of talent and potential that fizzled out all too soon. Although I speak highly of the album, it is by no means perfect and has its fair share of mediocre songs. The reason the album rates so highly in my eyes is because when the band does crank out a good song, it is good enough to eclipse the negative side effects of the poorer ones. In fact, the truth is that there are really only a handful of first rate songs here, with others that are hit and miss. Songs such as D. Form, Structure, Inventory, Step and Unlearn make this album as good as it is, where as many of the others aren't bad enough to be classed as filler material, but don't live up to the standard set by the stellar songs either. With Warhead Records long out of business, I doubt that it will be easy to get this album anymore, but with the band recently announcing a reunion perhaps they will be able to get it out onto the market again somehow. If you are able to find Structure in a second hand store or something I highly recommend picking it up. It is not only a great album, but is also a part of a great era in the Australian metal scene.